A short walk from Ueno station to Ueno zoo. Ueno Station (上野駅 Ueno-eki) is a major railway station in Tokyo's Taitō ward. It is the station used to reach the Ueno district and Ueno Park -- which contains Tokyo National Museum, The National Museum of Western Art, Ueno Zoo, Tokyo University of the Arts and other famous cultural facilities. In this course, we will walk from Ueno station to Ueno zoo through the beautiful gardens. 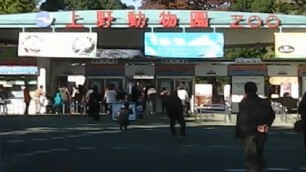 The Ueno Zoo (恩賜上野動物園 Onshi Ueno Dōbutsuen) is a 14.3-hectare (35-acre) zoo, managed by the Tokyo Metropolitan Government, and located in Taitō, Tokyo, Japan. It is Japan's oldest zoo, opening on March 20, 1882. It is a five-minute walk from the Park Exit of Ueno Station, with convenient access from Tokyo's public-transportation network. The Ueno Zoo Monorail, the first monorail in the country, connects the eastern and western parts of the grounds.